FROM A DARK URBAN LANDSCAPE THE SHADOW HUNTAZ BREATHE NEW LIFE INTO THE WORLD OF HIP HOP. 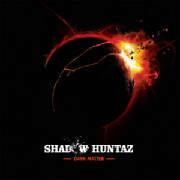 THE SHADOW HUNTAZ BLEND SCIENCE-FICTION AND URBAN LIFE INTO A MODERN DAY SOUNDTRACK. FILLED WITH POTENT RHYMES, TORRENTIAL BASS LINES AND SHARP BEATS, “DARK MATTER” WILL PROVE TO BE A HIGHLIGHT OF 2009.